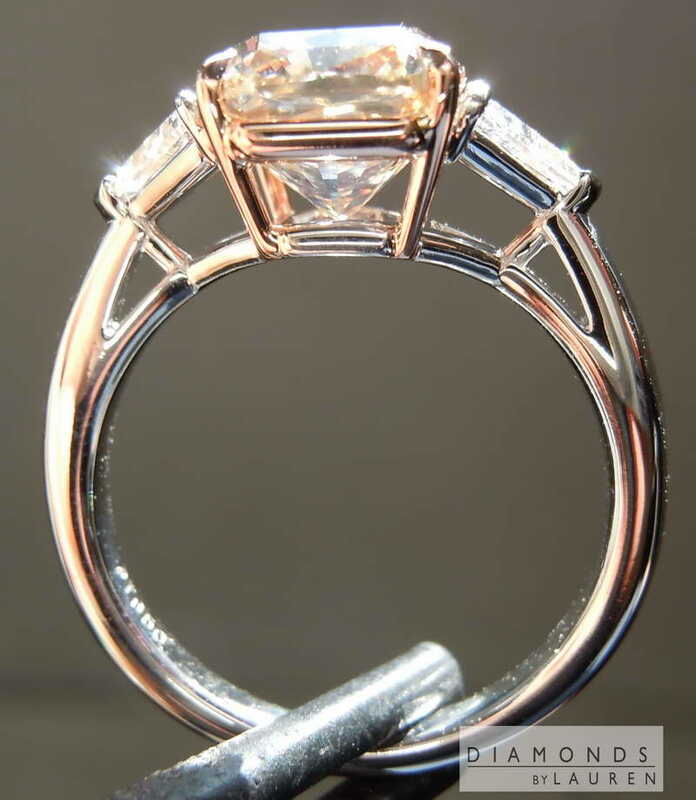 This is one amazing ring! 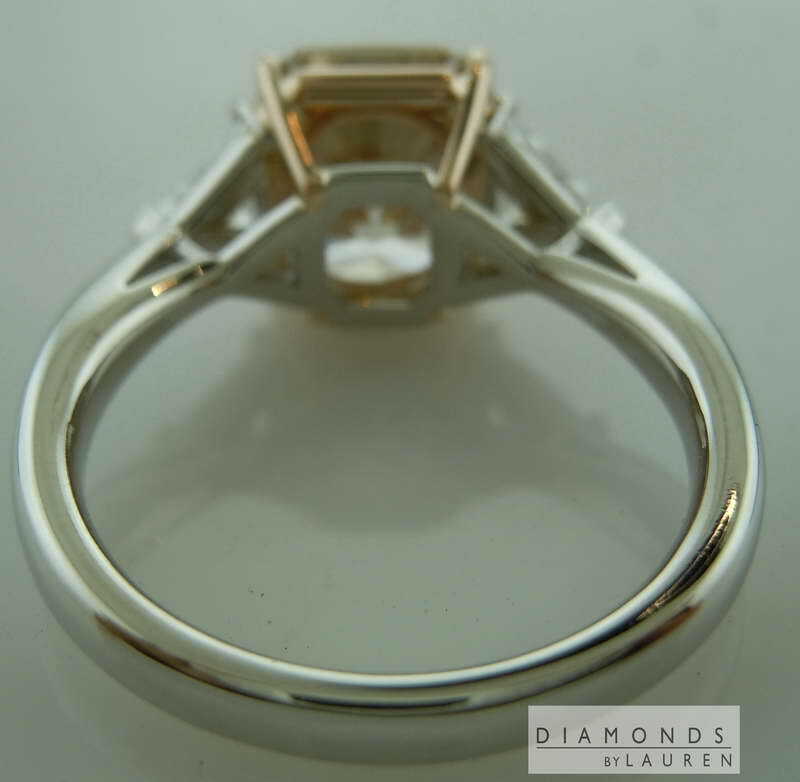 We buy a lot of matched pairs for rings like this, so we know the best cutters for them. 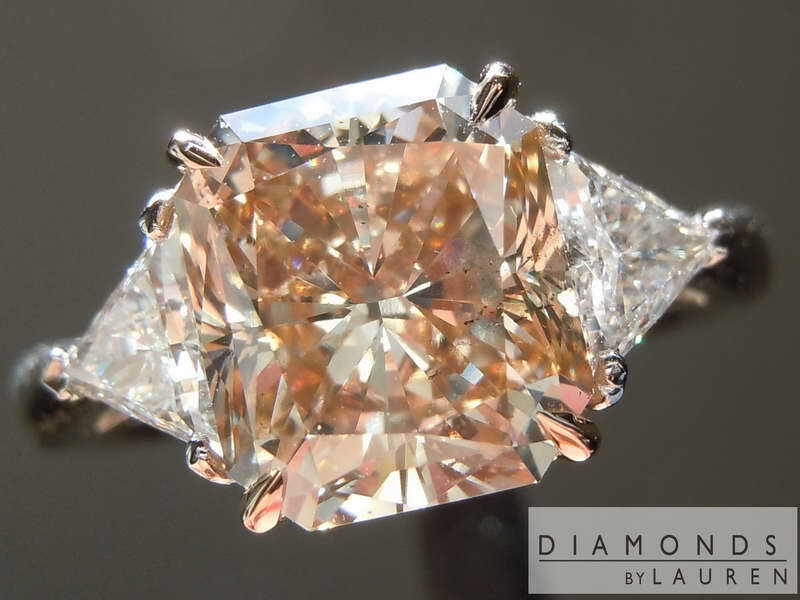 The side diamonds on this ring are trilliants and they are the perfect proportion for this ring. 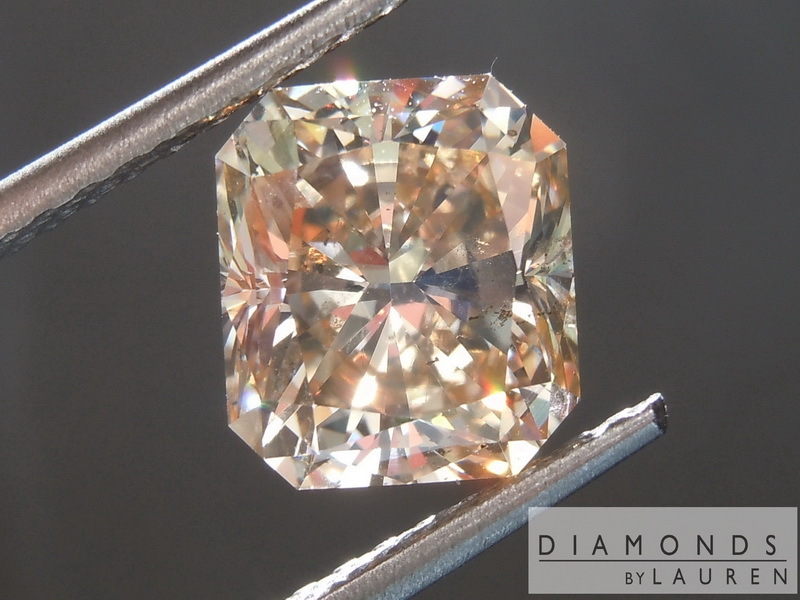 The color is icy white and is a great contrast to the center diamond. 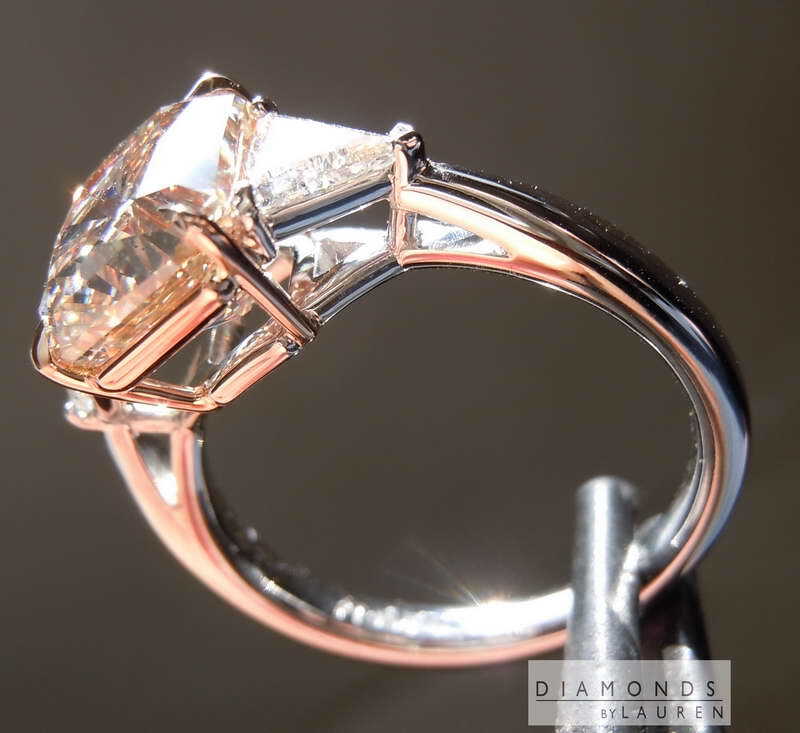 Set in a hand forged ring, the center diamond is set in 18kt rose gold claws. The remainder of the ring is in platinum. The shank is perfectly finished - 2.6mm at the bottom. 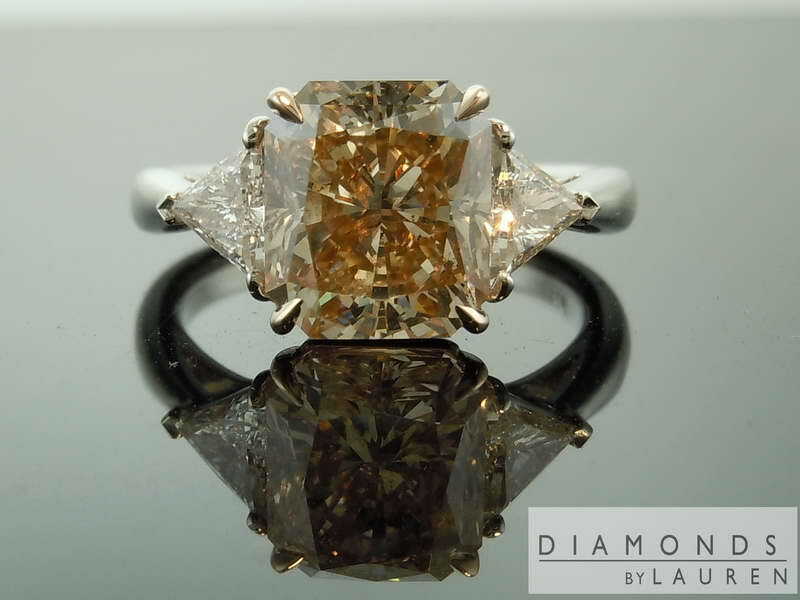 Here is a lovely three and a half carat Radiant Cut diamond. In terms of color, it is a lighter brown - not that light, the color is quite obvious. 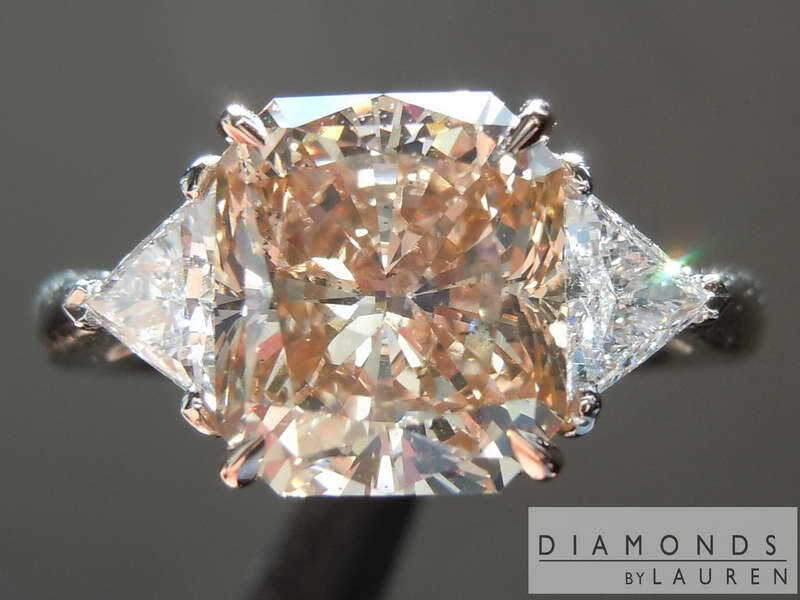 We cannot really discuss the color without involving the lovely cut. 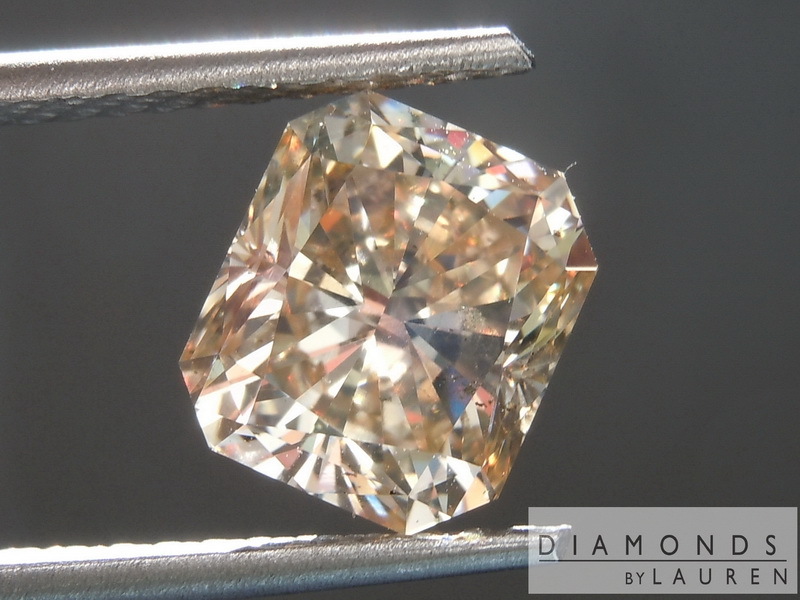 In the case of this radiant, the cutter produced a very bright stone - the types of reflections are large and bright. 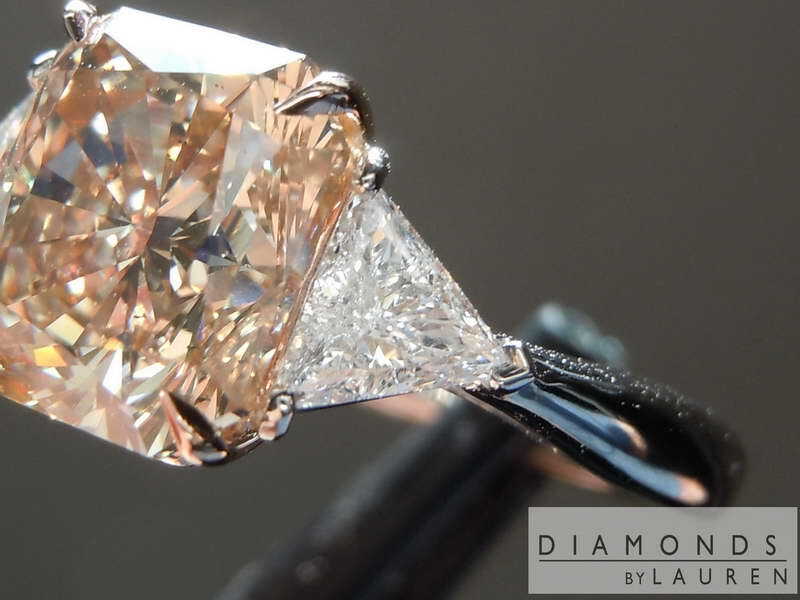 As opposed to many Fancy Colored Radiant diamonds, this stone is not a "crushed ice" look. 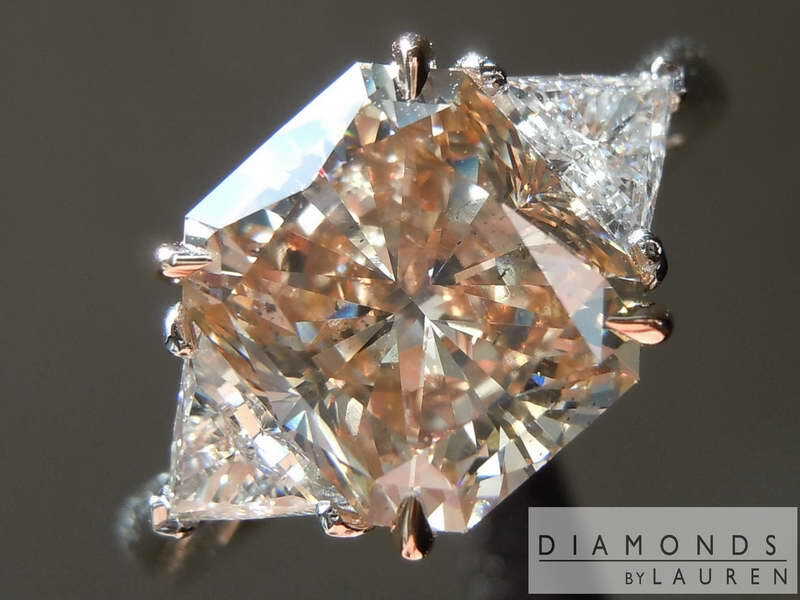 When we combine the large bright reflections, with the lovely light brown color, you get a bright brown diamond.The shape is exactly what you'd want in a broad rectangular Radiant shape. Generous corners. Small-ish table diamond. I guesstimate low to mid 60's for the table. 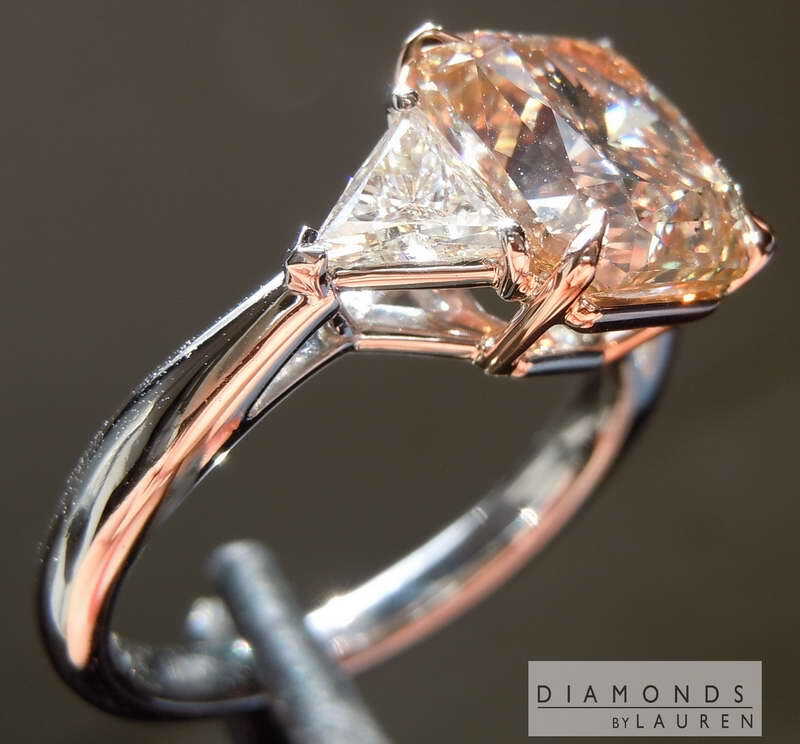 In terms or clarity, the diamond is eye clean. You can see the dispersed imperfections in the pictures. Those carbon points on their own would likely earn the stone SI1 from GIA. What you can't see is a feather on the back of the stone - totally non threatening and almost impossible to notice from the top of the stone, with a loupe. 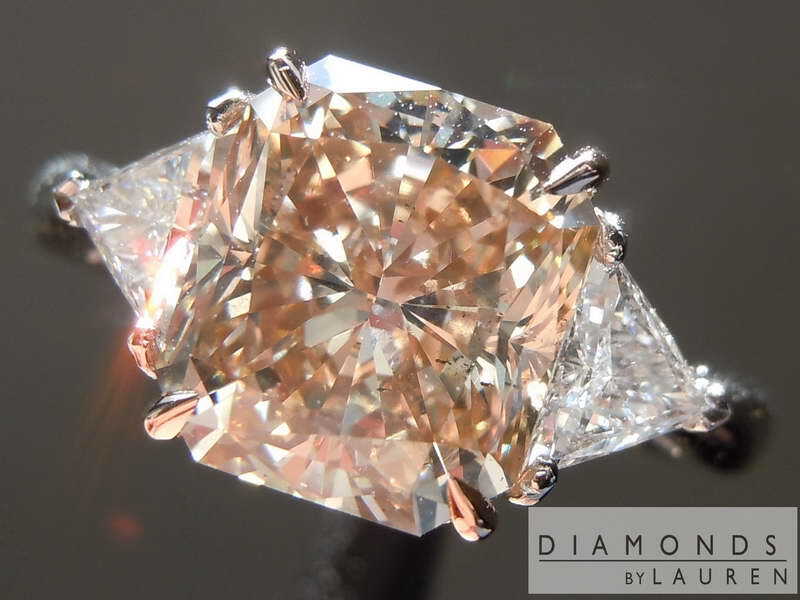 The good thing is, we bought the diamond, as an I1, it's priced like an I1 even though it was graded as an SI2.